This series contains over 20 separate revision activities that map directly to Foundation Stage, P-scales or National Numeracy Strategy targets. Each of the 20+ activities consist of a graded sequence of 20 to 40 simply presented multiple-choice questions. Correct answers result in a short animated sequence with music and spoken reinforcement while a fun ‘monkey story’ game adds to the motivation. Full speech support and switch access options provide access to learning by almost all students and simple performance reporting allows you to record student progress. 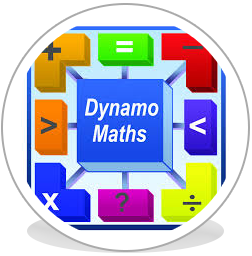 These activities were designed by a teacher and Maths ICT Coordinator with over 20 years experience in primary and special schools. The activities are structured using a positive reinforcement strategy without the need for intrusive on-screen help. 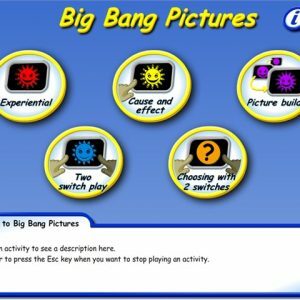 32 activities designed to give pupils revision in the knowledge learnt in practical lessons about numbers one to three. These 25 activities cover colour, 2D and 3D shape, positional words, opposites, sequencing shapes and time awareness (non-clock time). They map directly to the Foundation Stage targets and P-Level descriptors. Includes 21 activities covering matching and recognition of geometric 2D and 3D shapes, sequencing shapes, counting sides, nets, weight, length, capacity, and planes and symmetry. 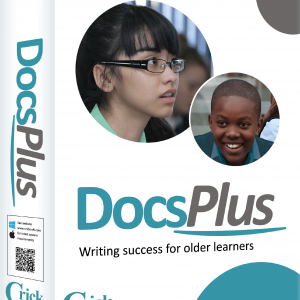 Directly supports all areas of the NNS at KS1. This has 21 graded activities covering comparison of quantity, counting sets of objects, counting on (rote counting), counting back, numeral recognition and matching sets to numerals. They map directly to the Foundation Stage targets and P-Level descriptors. 23 graded activities covering odd one out sets, counting sets, counting on (rote counting), numeral recognition, more than, less than and simple addition up to 10. This has 23 activities based around the 100 square, covering more than, less than, counting in 2s, 5s, 10s etc., number bonds in 10s and doubling. Over 25 activities about cash, from coin recognition to working out change. Includes “What can you afford?” activities. Coin images are enhanced photographs, giving greater realism whilst retaining clarity for VI students. 24 activities around time, from times on-the-hour up to counting on and back in units of 5 minutes, and everything in between. Many activities give you a choice of analogue or digital clocks. Includes an activity on weeks, months and seasons. 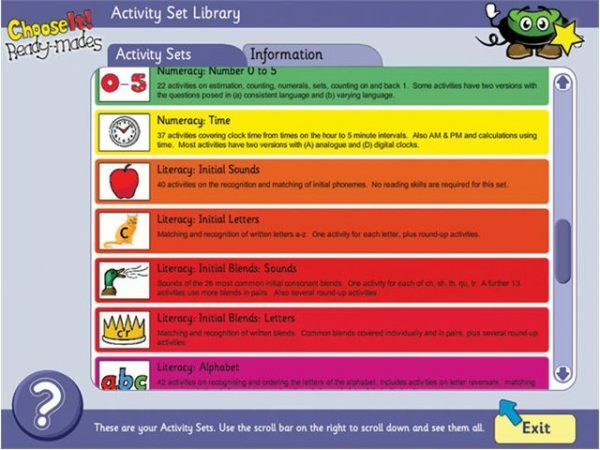 The Numeracy Series won the BETT Award for Special Educational Needs Solutions in 2008.